health and well-being are our priority. 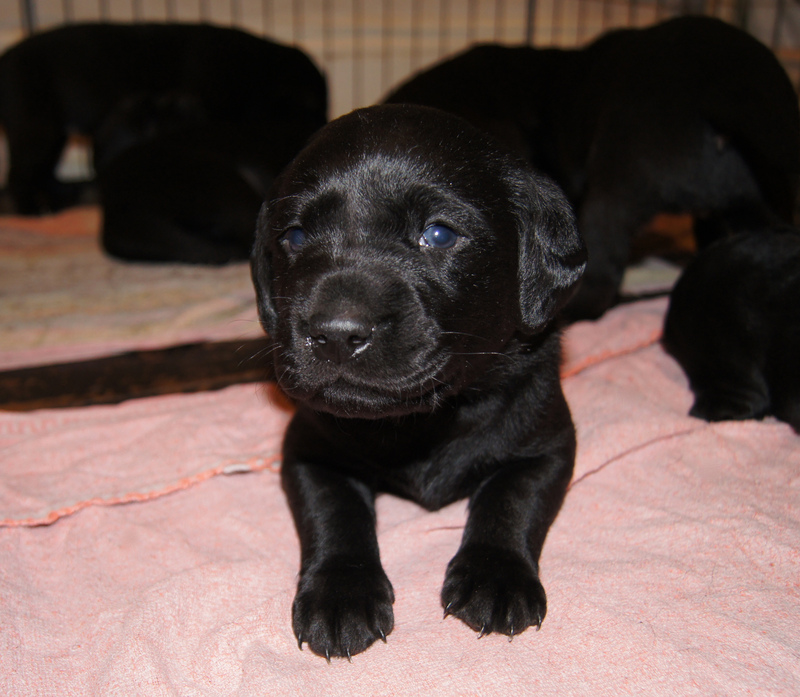 We are part of the Kennel Club’s Assured Breeder Scheme, our dogs are KC registered and puppies have pedigree papers. Our mums have all the health tests appropriate for their breed, as suggested by the Kennel Club. Studs are thoroughly researched and picked for their good health test results and genetic diversity (using the KC’s inbreeding co-efficiency calculator). We also consider intelligence, behaviour and manners. Puppies are born in our home and begin their lives as part of the family (hearing the hoover, radio, TV, washing machine and so on). Before they leave for their new home we take them to the vet for a check and their first inoculation. As trainers, we recognise the importance of socialisation. 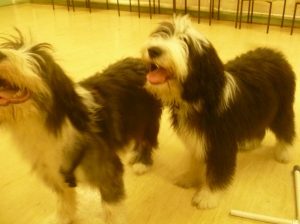 All pups are well socialised, meeting lots of new people, of all ages and ethnicities regularly. We also introduce them to people in uniforms (many thanks are due to our postman). We encourage those who have placed deposits on a pup to come and visit. This is a highly unusual step for a breeder, but it encourages the new owners bond with their pup and it helps us socialise the other pups. We begin training- teaching bite inhibition, which is explained to everyone who handles a pup. Pups start to learn their names, we begin training them to sit and our usual leaving present is teaching a new owner to teach their new pup to “leave it” and “take it”. 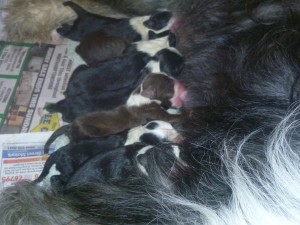 Information on first night home, the breed, health and first aid, puppy socialisation and training comes with each pup. We offer a money off voucher for our puppy training classes and encourage new owners to phone and email with news. We will help and advise whenever needed. Smudgey and Cossie have surpassed themselves again! 6 adorable babies were born- 4 boys, 2 girls. Mother Nature chose to give us all slate this time … too cute for words! * Both parents have hip scores of 3-3. * The results of the Kennel Club’s inbreeding calculator are very good at 3% under the national average. 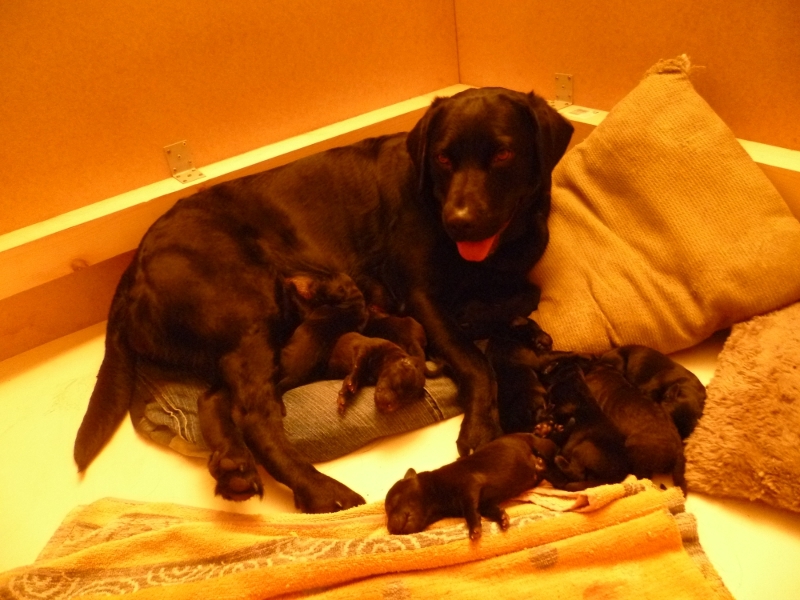 7 Labradors born 11th Jan 14. 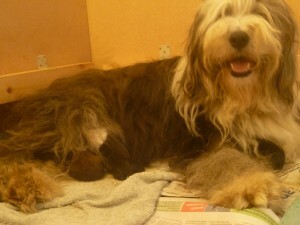 Poppy had 4 girls and 3 boys- very large, solid puppies who are very well developed. I love their shiny soft coats and little tails (which are learning to wag). They are progressing well, gaining weight and moving about the box. Hip scores results: Poppy’s hips are 2-3. Ash’s are 4-4. Inbreeding co-efficient is 3% (the national average is 6.4%). 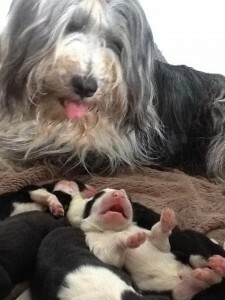 Poppy is a reliable, calm dog who is incredibly maternal and a very conscientious mother. She is very bright and really eager to please. 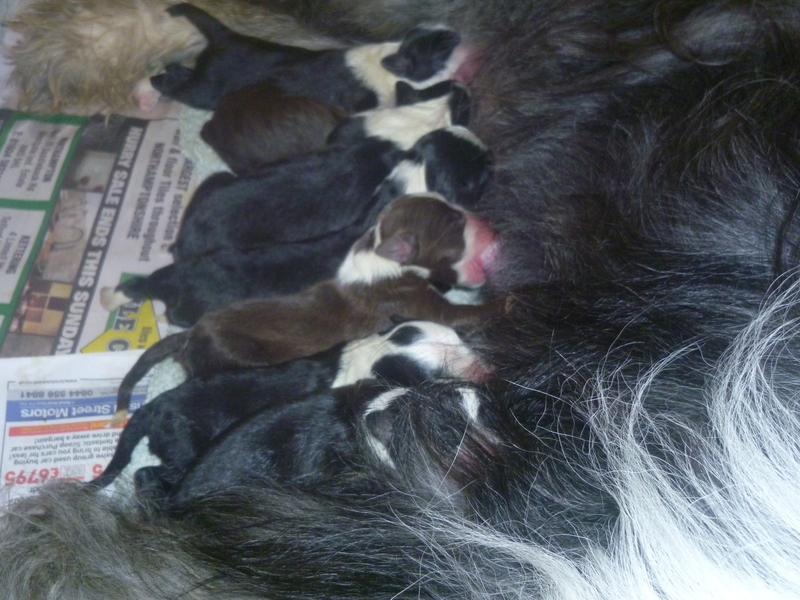 4 black girls, 2 black boys, 1 brown girl, 3 brown boys, gaining weight and feeding and sleeping well, so proud of our Smudge, who has taken to mothering very conscientiously. 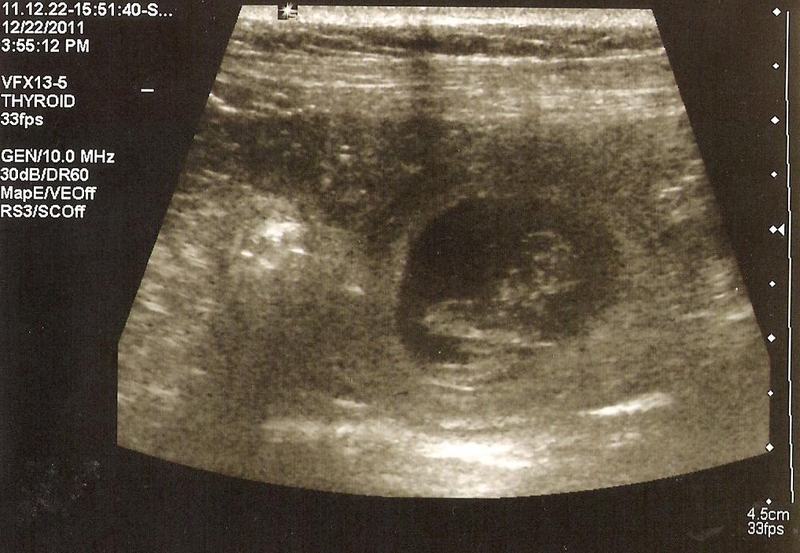 December 2011 … Poppy’s pregnant! We are pleased to announce that Poppy is expecting a litter of Labradors on the 25th of January 2012. It is no wonder Poppy’s is so clever- Poppy’s father’s side are gun dog champions and her mother’s is a mix of gun and Crufts champions. 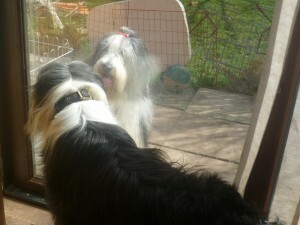 Poppy was successfully mated with Rufus and is now blossoming, taking it all in her stride. Rufus is a stud dog at Vilendal kennels, Northamptonshire. He has excellent health test scores: photo’s and his pedigree are available on their site. Poppy is our pet and lives with us in our home. Her puppies will be born here and will be used to all normal household noises. We will be posting more news and photos as soon as we can. 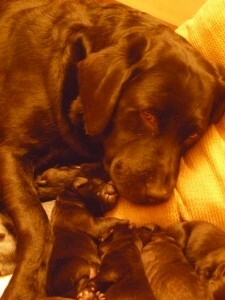 Update: 26/1/12 Poppy has had a litter of 8 Black and Chocolate Labradors. Mum and pups are doing very well! Puppies are doing very well. They are opening their eyes and taking tentative steps..